Good Interior Design is about getting things to work together to suit your life and the house. It's not about Fashion, more about good Style. Just because magazines say you should have flat hard sofas in white with purple cushions and a random Ikea print, does not mean you have to! If that is what you want, then great. But you have a choice. And pretty sure after a month you'll rid yourself of "showhome" look and have an opinion of what you want. Ulster Carpets have great range of plains and patterns. If don't like stripes, the tartan carpets are great halls and stairs especially. They have a grey toned one I used in a 60 sq metre Hall and Stairs. Amazing! Did anyone watch the RIBA Awards the other night? Well done to Schools, anything that inspires people and makes them feel proud is a good thing. 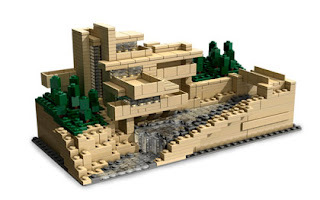 There was a cantilever house reminded me of Frank Lloyd Wright- no reference made to him- but here is a Lego version.